This tarragon chicken is super juicy and tender—and ready in 30 minutes, making it an ideal weeknight meal! Tarragon pairs well with chicken and this dish highlights its slightly bittersweet anise flavor and aroma. It has a distinct, elegant flavor. The secret to tender and juicy chicken in this recipe lies in briefly poaching the chicken. Olive oil, garlic, shallots and tarragon make up the basic sauce for the chicken as it first sears in the hot pan. Then, cooking the breasts the rest of the way in a bit of chicken stock makes every bite mouth-watering. Serve with a squeeze of fresh lemon. If you don’t have any shallots, simply use an onion instead! 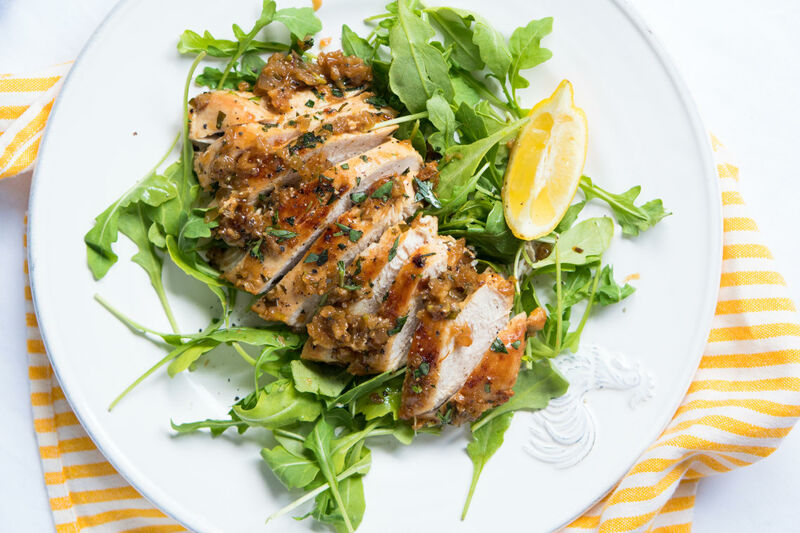 Try this tarragon chicken on top of a bed of arugula for an elegant light meal! Per Serving: 353 calories; 17g fat; 6.4g carbohydrates; 42g protein; 118mg cholesterol; 345mg sodium. This was super quick to put together, making a healthy, hearty lunch. Even though I didn't have the tarragon, I had to try, and used fresh basil instead which wilted in the heat and didn't hold up as well as tarragon will. The shallots and garlic gave the chicken great savory flavor and squeezing a healthy amount of lemon over the top brightened it up perfectly. This recipe is awesome - big flavor in a short amount of time from just a few ingredients. I would do a couple of things differently: I would start on medium heat to sweat the shallots and garlic and then raise the temperature to medium-high just before putting the chicken in. On medium-high, the aromatics flash-fry as soon as you drop them in the pan. Still came out good, because the shallot and garlic seep in the stock, but had to pull the pan off the heat and stir to keep everything from turning acrid. I left the heat at medium when I put the chicken in to get a bit of a sear, rather than dropping to medium-low. I used the remaining liquid like a pan sauce. I decided to skip the lemon, because I like the rich, warm flavor of tarragon too much to brighten it up. I had no idea tarragon was so good! This is quick, easy, and so different tasting from what I normally cook! Yum. This is a championship dish!!!! Super fast and so rich with flavor! I made this for my Saturday night dinner alongside the Beet Noodles with Maple Balsamic Dressing over Arugula and it blew me away. The prep work is simple and the chicken is so so juicy! This would be delicious with chicken thighs as well if you wanted a richer meat flavor. I served mine with rice but I think a fluffy serving of quinoa would be amazing with it! Eat up!!! Just a good dish. It's quick to easy to make and tastes great. I make my own chicken broth and this was a good excuse to defrost a bunch and use it. It was tender and moist.